Galectin-7 (LGALS7) is a family of beta-galactoside-binding proteins implicated in modulating cell-cell and cell-matrix interactions. Members of this family have been implicated in a variety of functions, including growth regulation, cell adhesion, migration, neoplastic transformation, and immune responses. 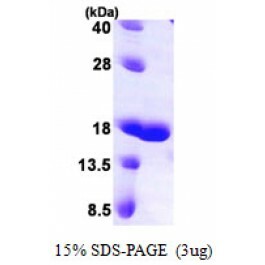 It is expressed mainly in stratified squamous epithelium, LGALS7 protein is activated by p53 and repressed by retinoic acid. 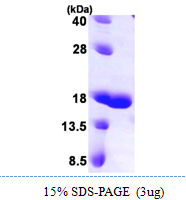 It is a pro-apoptotic protein that functions intracellularly upstream of JNK activation and cytochrome c release. Recombinant human LGALS7 protein, fused to His-tag at N-terminus, was expressed in E.coli and purified by using conventional chromatography techniques.